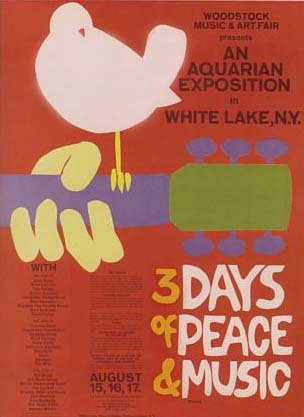 The Woodstock Festival, billed as “3 days of Peace and Music” was held on Max Yasgurs 600 acre dairy farm between the August 15th and August 18th 1969 and is regarded as one of the all time greatest music festivals and one of the most pivotal moments in rock music history with thirty two of the best acts of the period performing outdoors on a somewhat rainy weekend in front of 500000 concert goers. The festival forms the background for Ang Lee’s Taking Woodstock (2009) and is based on Elliot Tiber written memoirs whose coming of age is the focus of the narrative. Tiber is a failing interior designer in Greenwich Village New York who has moved back in with his overbearing mother and father to help run a dilapidated motel on which the bank is about to foreclose. When Elliott finds out that a nearby town has withdrawn a permit to run their “Music and Arts Fair” he calls the organisers hoping to drum up some business for the El Monaco Motel. Three weeks later an Aquarian Exposition takes place in Bethal on the farm of a close neighbour. Peace and love in the mud. Tiber is played by the American comedian/actor Demetri Martin, his mother Sonia is played by a scene stealing Imelda Staunton as the head of her Jewish clan who is “poised to invoke the Holocaust at the merest whiff of disrespect”, her enduring husband Jake is played by Henry Goodman. Characters dip in and out of the story the best of which is Vilma, an ex-marine transvestite played by Liev Schreiber in a frock and a blond wig. My suggestion would be to watch Michael Wadleigh’s Woodstock – 3 Days of Peace and Music a documentary edited by Thelma Schoonmaker and Martin Scorsese originally released in 1970 with the directors cut released in 1994 then sit back and enjoy the Ang Lee movie. Peace man!